Looking for a smooth step down from common blade shapes? The full size Wildwater blade is probably too big for you. The Wildwater 7.5 is a Wildwater blade rendered at 7 5/8” wide- a bit smaller and lighter than the full sized blade- but very popular with serioso steep creekers. This is a big blade with good swing weight. Racing and big blades have long been a tradition in our sport. It’s all about get up and go. You need plenty of blade for the catch aspect of the stroke and you need the paddle to be light but strong. The Wildwater blade has a canted tip to correlate with the entry angle for maximum blade on entry impact. These blades come in 2 sizes – the 7.5 and full WW- at 8” wide. Note that I make them trik style by default. If you want a curved powerface I can do that but it needs to be special request. Having them be trik style means the ash plates run all the way to the tips for a high strength to weight ratio and consistent flex through to the tip. These are also excellent choices for someone who is used to common synthetic blade sizes on the market- and wood tends to be more robust and repairable. Trying to relate to the beauty of racing? 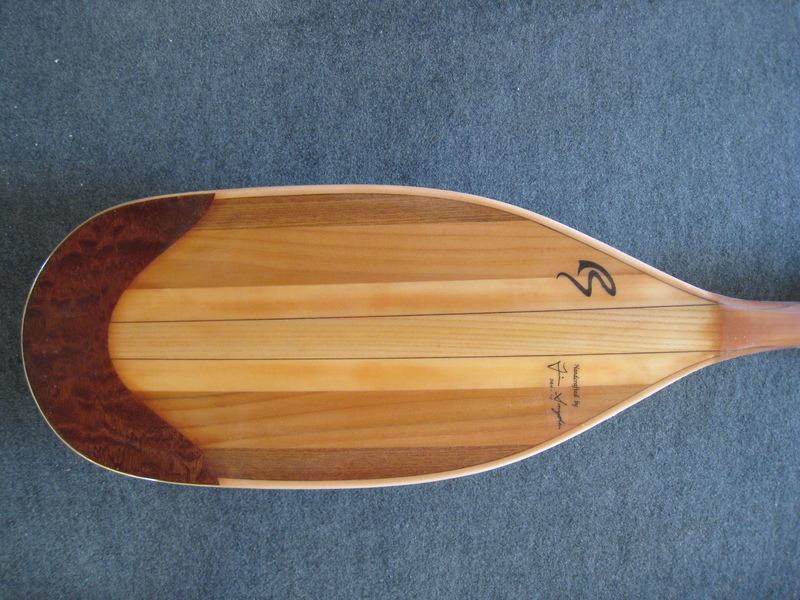 These should be your first choice for wood racing paddles- very tough with great swing weight.